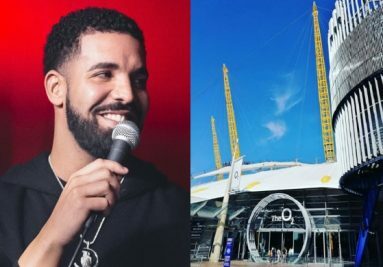 Drake is one of the biggest rap artists in the world today and this April sees him performing for an unprecedented 7 nights at London’s O2 Arena on his UK & European Assassination Vacation Tour. Born in October 1986 and named at birth Aubrey Drake Graham, Drake grew up in the Toronto suburbs of Weston Road and Forest Hill. At the age of 15 he dropped out of high school to pursue a career in acting. By the latter half of the decade, music became his big draw. The prolific Canadian rapper announced in January this year that he would be coming to the UK and Europe with his Assassination Vacation Tour. So far he has played in Manchester, Paris and Birmingham. His weeklong residency at The O2 Arena begins this coming Monday 1st, Tuesday 2nd, Thursday 4th, Friday 5th, Monday 8th, Tuesday 9th and Thursday 11th April. He will be accompanied at the 02 Arena by fellow Canadian rapper Tory Lanez. The O2 Arena, situated in South East London on the Greenwich Peninsula is a multi-purpose indoor arena with a seating capacity of 20,000. Doors open each night at 6 pm with the main concert starting at 7 pm. Although the arena can be reached by public transport, you might wish to arrive for your night in style. Here at TST Car Services we are able to offer a range of competitively priced London chauffeur cars to take you and your guests to and from the London O2 Arena safely and in comfort.